To what degree that narrative was factual is hard to examine but it has been kept alive by different products and programs to the present day. The new episode of HBO’s Real Sports with Bryant Gumbel entitled “Changing Face of Football” reveals how the narrative has popped up in a perhaps unlikely place: American football at the high school level. The show begins with a conversation with a head coach of a high school football team in Princeton, N.J. – yes that Princeton – the home of the Ivy League institution. Overall participation numbers in the sport have declined to the point where instead of spending time deciding which players to keep, that time is being devoted to recruitment for the teams. HBO’s Bernie Goldberg asked him, “How do you recruit kids?” The coach replied, “I’m standing outside my classroom every day. And I’m introducing myself to those kids.” This wasn’t just at the start of football season, but throughout. Real Sports goes on to detail how Princeton’s high school football landscape isn’t a deviation from, but rather another example of what’s becoming the norm. Participation in the sport at the high school level overall is on the decline across the nation. There’s one twist in the story that Real Sports dives into next. When considering students from lower-income families and whose parents have achieved lower levels of education, participation at the high-school level in American football has actually been on the rise recently. As an explanation for that statistic, Real Sports simply connects the dots. 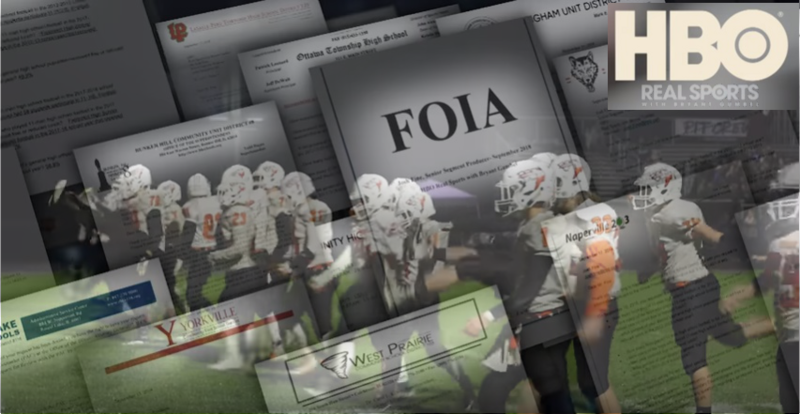 Real Sports invited Dr. Emily Kroshus, a professor of pediatrics at the University of Washington, to review their research from the thousands of documents they’d obtained through the Freedom of Information Act. Real Sports also spoke to mothers. An unnamed Princeton mom told them, “We feel strongly that knowing what we know about the science, the brain science – the damage that can happen – that flag should probably be it.” When Bernie Goldberg spoke with Jamiece Jamison who lives in a less affluent section of Oak Park, Illinois, “So what role does a football scholarship play in this idea that he’s gonna go to college?” She confirmed that she sees football as a way for her son to get ahead. Real Sports goes on to point out this sales pitch wouldn’t be so effective if there wasn’t what appears to be a gap in education about the dangers of American football for high school students. In a conversation with Dr. Chris Nowinski of Boston University, the lack of education about risks of neurological trauma inherent in the sport among lower-income families is highlighted. “The more educated you are, the less likely you are to smoke. The more educated you are, the more likely you are to wear your seatbelt every time you drive. So, the more educated you are, the more likely you are to engage in things that aren’t gonna let you get hit in the head,” Nowinski says. This episode of Real Sports, slated to premiere on Tuesday, Jan. 29, points out how a “perfect storm” has been created to set up high school football coaches desperate for players to resort to similar methods that 20th-century encyclopedia salesmen employed. A new type of “white flight” from the sport at the high school level has created vacancies on rosters. The abundance of scholarships for the sport at the collegiate level are an enticing prospect which plays into a lack of means to provide a post-secondary education. A lack of information about the health risks of playing the sport at these ages greatly enhances the chances of families opting to engage their sons in the game. The greatest tragedy of the situation occurs years later, when these sons of African-American and/or Latino families find out what they really receive for their efforts. Instead of being rewarded for risking their lives with high-quality educations that lead to high-paying careers, they are abandoned physically broken with no college degree or a worthless degree and no financial recompense either, while the coaches and bowl game executives usher in a new crop of “human cattle” to fatten their own wallets. The sales pitch being offered to these families is a path to a better life. Reality couldn’t provide a more stark contrast. The “Changing Face of Football” episode of Real Sports demonstrates how the system actually works to keep these families at economic and educational disadvantages.